The full name for these tasty bits of dried corn is Chicos del Horno referring to the traditional method of steam roasting the corn in an adobe oven called a horno before the corn is dried. The remains of chicos like corn have been found at Anasazi sites which indicates that it is a very old method of preserving the crop. It was at one time a common and widespread foodstuff but unfortunately it seems to have been mostly forgotten except in parts of the southwestern US and particularly in New Mexico. 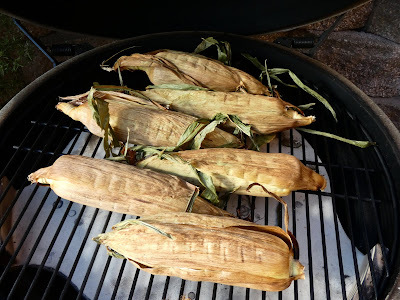 It's a sorry thing that chicos have largely been forgotten or overlooked in favor of easier modern methods of preserving fresh corn because they are incredible little flavor bombs and far superior to any canned or frozen sweet corn that I've ever tasted. Not only that, they are very easy to cook. The onerous work is in the processing of the fresh corn into the dried form. The freshly harvested corn is left with the husks intact and soaked in cold water for at least an hour or while the horno is heated with a wood fire which takes a few hours. Once the horno is super hot the fire is raked out and the oven is packed full of the corn still in its husks and the oven is sealed up tight. The corn is left to roast for hours until the oven is cool. Then the corn is removed from the oven and the husks are pulled back and the silks cleaned away. The cleaned ears of corn are strung into ristras and hung in the sun for a few weeks until it is completely dry. And then the really hard work of removing the kernels from the cobs must be completed. I don't happen to have a horno so when I decided to try to make some chicos myself I opted to use my Big Green Egg. I followed the method that I outlined above, first soaking the corn in cold water while I set up the Egg for indirect cooking. Various food bloggers recommend roasting the corn in a regular home oven at 300ºF to 350ºF for anywhere from an hour to 4 hours. I opted to heat the Egg to about 300ºF and roasted the corn until the husks turned brown and the corn was fragrant and the kernels cooked. That took about 2 hours. Fresh green field corn in its milk stage is what was traditionally preserved. It is sweet but not as sweet as the corn-on-the-cob that we enjoy now. Native Seeds Search says that flour corns which have soft starchy kernels are appropriate for making chicos. But I'd read that modern sweet corn works just as well as green field corn and in my experience it makes fantastic chicos. I found some really fresh bi-color sweet corn at the farmer's market and brought home a half dozen ears to experiment with. That's my first experimental batch shown in the Egg when I deemed that they had roasted enough. Actually two of the ears were consumed right away because fresh roasted corn is too good to pass up. I also deviated from the tradition of tying the corn into ristras and sun-drying it and instead used my dehydrator. It's not a quick process to completely dehydrate a whole ear of corn, if I remember correctly it took more than 24 hours, but the kitchen smelled fantastic. The most difficult part of the process is removing the kernels from the cobs. 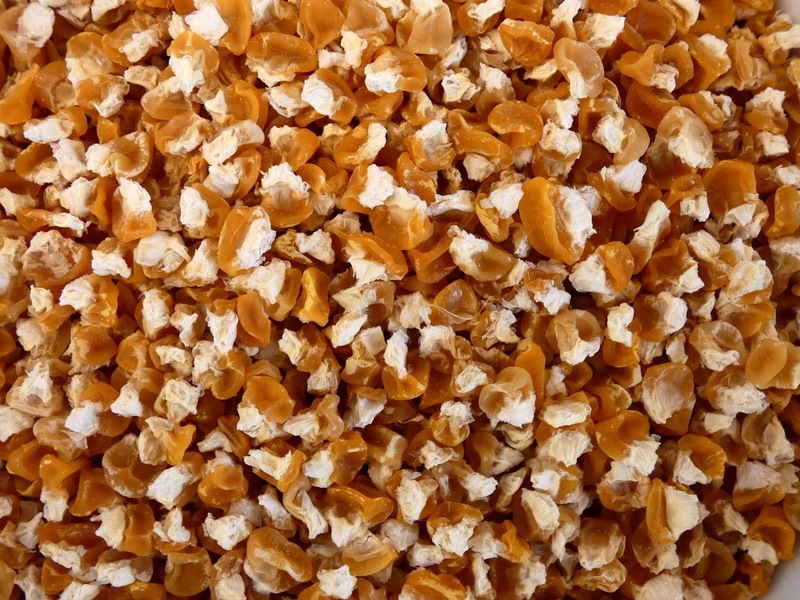 The kernels tend to stick to one another and adhere very tightly to the cob. I found it necessary to pop them out using a long thin oyster shucking knife which has a sturdy blade but is not sharp. After shucking I ended up with about 1/4 cup of dried kernels from each ear of corn. But the end result is worth all the work. I made a few more batches of chicos through the summer and ended up with a quart jar of dried corn. So how to cook these tasty morsels? A traditional way is to cook them up with some dried beans, just add the chicos to the beans and cook them as you normally would. Another traditional dish is to include them in a stew of meat with chiles and other seasonings. For my first experiment cooking with chicos I opted for something nontraditional, farro salad. I started with a recipe from Nancy Silverton's book Mozza at Home and substituted chicos for about a quarter of the farro that was called for. I first soaked the chicos in cold water before cooking them with the farro. The chicos plumped up nicely and came out tender and tasty and almost like freshly roasted corn just cut off the cob. Verdict - fabulous. Another dish I tried was lentils and chicos cooked together. This time I skipped the presoak and just added the dry chicos together with the dry lentils. Again they cooked up just fine. So I'm thinking that chicos can be used in just about any dish where you want the flavor of roasted sweet corn. Soups, stews, salads, veggie sautés and stir-fries, salsa, tacos. I've got more experimenting to do! And I will definitely be roasting up some chicos again next year as soon as I spot some fresh sweet corn at the farmer's market. If you want to try cooking with chicos yourself don't worry, you don't have to make your own from scratch, do a web search for "corn chicos" and a bit of hunting will lead you to a few sellers (even one on Amazon). After trying some you may want to make your own too. Here's some links to articles about Chicos that I found to be informative. ¡Hola, chicos! Ancient trick transports corn into winter. sounds so good ... I can smell it from here ... the idea of cooking beans and dried corn together never occurred to me .. yum-yum .. must try it soon. I’ve never heard of these ot even of drying corn kernels. So very informative! And interesting that fresh green field corn was traditionally used. My dad grew up on a farm and he said they used to eat their young field corn roasted, which he called 'roasting ears'. I'll have to do more reading, perhaps I could make them myself next year. Too bad I don't still live on my farm, because I could get fresh green field corn there. The fellow who rented it from me grew a special white corn that he sold to Azteca Milling to turn into corn chips and tortillas. I had never heard of this method of preserving corn - sounds wonderful! I'll definitely have to give it a go at some point - probably with locally grown corn as I'm taking a break from growing it myself as well (still haven't figured out who the corn stalk muncher is!). I was wondering, though - could you get away with cutting the kernels off the cob after roasting and then dehydrate them instead of removing them after the fact? Interesting! I have no idea at the first.